Both instances of SCP-XXXX. On the left is SCP-XXXX-2, and on the right is SCP-XXXX-1. Special Containment Procedures: All instances are to be kept within glass cases in standard anomalous storage at Site-██. This anomalous storage unit must only be accessed ny staff with a level 3 security clearance or higher. Description: SCP-XXXX has two instances. SCP-XXXX-1, is a blank white mask which resembles that of the Blank White 83 Cesar Male facial mask. When SCP-XXXX-1 is worn, the mask will animate and portray the psychological state of the subject. SCP-XXXX-1 returns to its resting state when removed. SCP-XXXX-2 is a Blank White 86 Cesar Male facial mask. When worn, SCP-XXXX-2 causes the wearer to adopt a fully neutral psychological state. 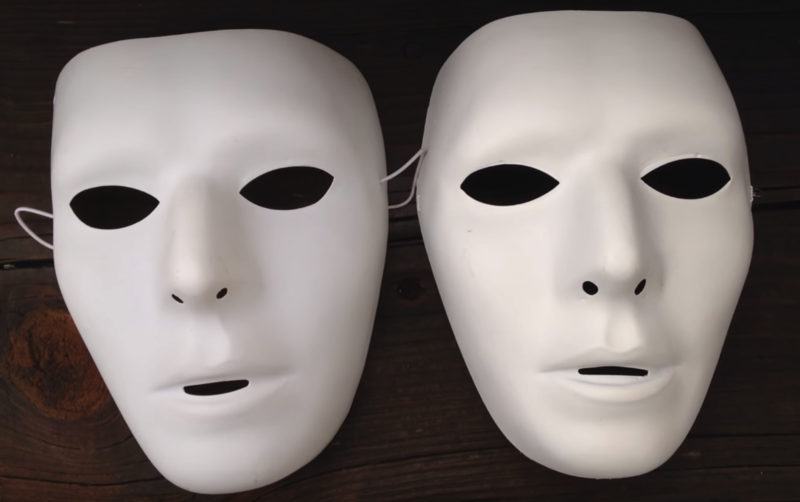 When the mask is removed, the wearer will return to their original physiological state. Subject: D-44626. Male, 26 years old. Subject was instructed to wear SCP-XXXX-2. Subject was then subjected to intense visual trauma for a period of ten minutes but showed no signs of distress during the course of testing. After this, subject was instructed to remove SCP-XXXX-2 at which time he exhibited symptoms of extreme distress.